The Hydroswing® hydraulic door can be installed on any new building, or retro fitted to existing an aircraft hangar, industrial shops, and block or steel architectural structures. Hydroswing® specializes in bifold door replacements and is the ideal solution for replacing all existing types of bottom rolling, accordion, fabric and sliding doors. The Hydroswing® door is pre hung in its own frame and is easily installed. Hydraulic doors add efficiency to your building with up to 70% less moving parts than bifold doors. Hydroswing produces hydraulic doors for the aviation, biomass, industrial, residential garage and ISO shipping container markets, as well as others. We manufacture to ISO 9001 and AWS D1.1 standards. Our hydraulic door can be built in any size as large as 40' tall to 150' wide with 100% sealability and our patented Zero Drop HydroLok™ safety mechanisms making the Hydroswing® door a next generation door system. Hydraulic Doors for Aircraft Hangars, Architectural, Industrial and Mining. 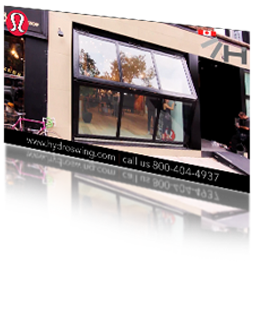 Hydraulic Hangar Doors are Hydroswing's signature product. We offer hydraulic hangar doors for all types of buildings ranging from T hangars and large corporate to MRO hangar facilities and airpark house doors. Our bifold replacement is pre hung in its own frame and is easily installed with up to 100% sealability. Walls and doors have no limits with Hydroswing®. Our single panel architectural door system can be used to transform any home, garage, or commercial building. Hydraulic garage doors are the wave of future and hydraulic overhead doors are becoming incorporated in designs for both architects and builders. Hydroswing® doors are revolutionizing the industrial and mining sectors. The best biomass doors are now hydraulic doors as they offer superior strength and almost 100% sealability. Our specialty ISO shipping container doors are innovatively improving storage and conversion. Watch the Hydroswing® in Motion! The Hydroswing® is the original hydraulic aircraft hangar door, commercial, industrial and architectural single panel door system. The Hydroswing® single panel hydraulic door system covers sizes from 10' wide to 150' wide and up to 40' tall. Combining single panel hydraulic door strength and security with ease and reduced cost of maintenance. The Hydroswing® Hydraulic Door can be copied but can never be beat. We have over 7,000 units in service world wide, with over 1,100 Hydroswing aircraft hangar doors in Florida alone. 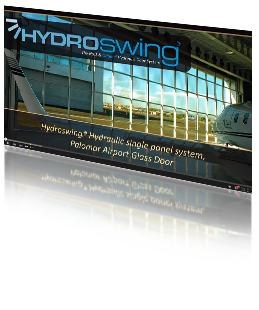 Hydroswing® is the door replacing the Bi-fold in many retro and refurbishment hangar projects. The Hydroswing® door easily retro fits to replace the Bifold, stacker, bottom rolling, top hung and sectional panel hangar doors, along with an easy choice for the new build in all the main building types of post and frame, steel (PEB), portal frame, stick, tensile, none structural and now easily to the ISO shipping container shelters and conversions with the addition of the ISODOOR™ hydraulic door system for the ISO shipping container and shelter markets. The Hydroswing® Hydraulic Doors is still the original and only fully engineered, ISO 9001 built single panel hydraulic door system available today, in several regions around the world including the United States of America.